Canada’s first diamond producer and part of Canada’s heritage, the Ekati mine, is soon to pass into the hands of a private American firm. YELLOWKNIFE, NWT – The management of Dominion Diamond Corp. has agreed to accept the sweetened takeover offer of the Washington Companies, the private company based in Missoula, Montana. In March, Washington offered US$13.50 per share, and the Dominion board turned down the deal. 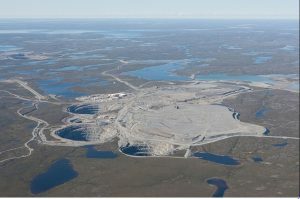 Now offering US$14.25 per share, Washington looks to be the new, sole owner of the Ekati diamond mine (Canada’s first) and 40% of the Diavik diamond mine (operated by 60% owner Rio Tinto). The offer is a 44% premium over the March 17, 2017, share price and puts a value of US$1.2 billion on Dominion. Readers will remember 10 years ago when Vale bought up Inco and Xstrata (now Glencore) scooped up Noranda/Falconbridge. Most of the writers who marked that anniversary recently thought the change in ownership did little to further Canadian mining or our place in the global minerals industry. I do understand that the Dominion board has a duty to its shareholders to maximize the value of their holdings. By that standard, Dominion has done a great job: a huge premium over the recent closing price of its shares. What makes me unhappy about the deal is first that the buyer is foreign; second as the owner will be a private enterprise, there is no requirement for public reporting; and three the deal includes Canada’s first diamond mine, a part of our heritage. Washington vows to operate Dominion as a stand-alone company as it does its other similar businesses. Washington owns Montana Resources that operates a copper-molybdenum mine in Butte, Mont. That company’s website is thin on information of the nuts-and-bolts type that describe the mine, resources, mineral processing plant or outlook. Even a phone call to Montana Resources could not elicit a name for the mine beyond “Montana Resources”. With Dominion privately owned, the flow of information and news from Ekati and Diavik will certainly dry up. How are Canadians supposed to find out what is happening if there is no requirement for public disclosure? If this is the case, not much is going to change at Ekati or Diavik, except that the profits will be transferred out of Canada. What will change is that Dominion can no longer be listed as one of Canada’s Top 40 mining companies. Washington is quick to list the many benefits to Canada of its plans. Stand-alone business. A new CEO. Keep Dominion’s headquarters in Canada. Mostly Canadian management team. Develop the Jay and Fox Deep projects. Greenfield exploration. Environmental stewardship. Long term, high paying jobs. Focus on indigenous recruitment, training and employment. Honour existing commitments to aboriginals. Continue to fund scholarships and community development. Deal with local suppliers and contractors. Promote Dominion’s CanadaMark brand. Can we trust Washington’s promises? It seems we have no choice. Both parties are determined that this is a friendly deal. Is there no white knight who could offer a bit more and keep Dominion a public Canadian company? Does the federal government care that we are losing a valuable – and shining – part of our Canadian heritage? It hurts to see another Canadian miner pass into foreign ownership, and private at that. It hurts my pride both as a Canadian and as a long term industry watcher. Details of the proposed takeover are available at both www.DDCorp.ca and www.WashCorp.com. COMMENT: New chapter for Canadian diamonds?